The deaths of Prince, Tom Petty and other musicians who'd privately suffered from chronic pain after grueling years on the road reminded us what a physical act performing really is, and how often its toll is kept hidden. The human voice is the most physical instrument of all, its sound generated by delicate, undulating pleats of flesh in the throat that give each singer a distinctive timbre and are exceedingly vulnerable to all manner of injury and decline. But that unique form of vulnerability isn't something that most singers are comfortable talking about. Kathy Mattea and Alanna Quinn-Broadus are exceptions to that rule. 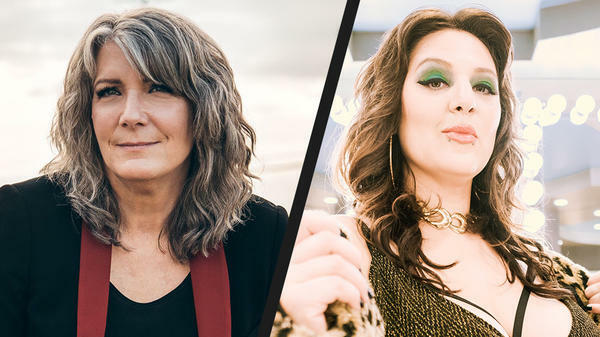 They inhabit completely different musical worlds — Mattea a sophisticated folk-country singer-songwriter who enjoyed major mainstream success from the mid-'80s into the '90s and Quinn-Broadus the impetuous frontwoman and songwriter of the muscular, horn-heated, Nashville-based soul band Alanna Royale. But each artist has been stopped in her tracks by vocal difficulties and, together, speak a shared language about how profoundly they were changed by those ordeals leading up to their latest releases. Mattea's rapturous exercise in song interpretation, Pretty Bird, was released Sept. 7 and Alanna Royale's punchy, vital EP, So Bad You Can Taste It, was released in Aug. 3. The two artists had barely been introduced by this interviewer — Quinn-Broadus, the last to arrive, hadn't even made it to the counter to order her tea --before they sailed into conversation. Mattea played the part of the reflective veteran and Quinn-Broadus the salty striver. Both of them were refreshingly open. You were at very different places in your careers when your voices stopped working the way they used to. What got your attention? Kathy Mattea: I would go up for a note I'd sung for 25 years, and one night it just wouldn't come out. It'd either be tight or flat or pinched. It wouldn't soar. So I'd think, "OK, tomorrow night I need to pay attention to that place." So I would, and it would happen again. I kind of ran from it inside for a while. I was like, "No, we're just gonna keep working." And finally I was like, "I'm gonna have to look at what this really is." I took six months off the road. ... I'd had a teacher since I was 19 and her health was declining. She wound up dying while I was in the middle of this process. So I had to find another teacher [jazz vocalist Judi Vinar], and I dug in. I didn't know if this was the beginning of the end of my voice. If it was, I wanted to be able to make other choices. ... There are [singers], I've heard their voices age and it's hard for me to hear them. I have to be able to enjoy what I hear coming out of my own mouth to keep going. Alanna Quinn-Broadus: Did you go to a doctor? KM: It felt technical to me, not so much like a physical problem. I could feel myself muscling. I could feel myself tightening. I could feel myself trying really hard. ...What I've discovered is when I went through menopause, the break between the chest voice and head voice went down about a half step. You know how to navigate that transition, so you go for it, but your body's changed, so the way you learned over decades doesn't work anymore. It freaks you out. AQB: Damn, that's crazy. Do you feel better now? Are you in a good place now? KM: It was about a three-year process, but I feel like I've been reborn. ... The best way I can put it is I thought, "You've had a good, sturdy instrument. It's like a Volvo. It's classy, dependable. It's served you well, and if you take care of it, you can keep driving this thing." What happened was about halfway through this process, my teacher was like, "Kathy, I would just encourage you to not think of your voice as diminished. It's different, but it doesn't have to be not as good." I came to think of it as, "Maybe I've got a vintage Ferrari on my hands. I just don't know how to drive it." The other thing that happened to me that really influenced this process was years ago, I got about a 10- or 15-minute chance to talk to Tony Bennett. I said, "I heard you sing tonight and I know how old you are." He said, "My voice isn't what it once was, but it's a lot better than it was a couple years ago. I found a teacher and I started working again." And I thought, "If Tony Bennett could do it in his 70s, I can do it in my 50s." What was your experience, Alanna? AQB: Mine was totally anatomical. Mine was totally misuse and overuse and abuse. I thought it was just wear and tear. ... I would do vocal rest constantly and then go back and be back in the same place again. Then it got to the point where, after a show, I was just going to a hotel and not talking, just crying because I was so distressed, and then not talking all the next day, then singing and it still was rough. I was like, "Oh god, this is not sustainable." So, I went to Vanderbilt, and the response at Vanderbilt on the clinical side was, "You don't have any nodules," but I had a hemorrhage. KM: So did I, in the early '90s. AQB: I was super desperate, and at this point we had started recording a record [2014's Achilles], and we just kept doing it. That's got to be a lot of pressure. I read that it was meant to be recorded live with the band in an analog setting, but you couldn't handle that process at the time. AQB: Listening to it now is so painful. I still wasn't getting where I thought I should be. It didn't feel normal yet. So I went on YouTube and searched and this woman [Sophie Shear] came up and I watched her video. I emailed her and I was like, "Please help me! I am f******* spiraling. My voice is totally out of control. I am in pain. I can't sing." She writes me back and says, "OK, don't worry. We're gonna get through this." And she changed everything so drastically that I can't imagine my voice without her. Kathy, you'd been studying with someone continuously since the age of 19 all through your performing years. Alanna, you went to Berklee and studied voice. So how prepared were you to come up against these limitations? KM: It freaked me out even more because that's why I did that. [I] was to try to prevent that. AQB: You feel like you should know better. KM: Yeah. But what I've learned is that there's all kinds of different ways of practicing. Every Thursday, I would just jam with Bill [Cooley], who's played guitar with me for 28 years. So he comes over and I would just throw out songs: "Look, I want to get to know my voice in a different way." So we would just play all afternoon. Sometimes his head would snap around and be like, "Holy crap, Kathy! Where did that come from?" And he knows my voice as well as anybody. And then the next week, same song, nothing. Then I would just burst into tears and sob for a half hour. A lot of it was becoming present enough to discern when I was doing old habits and when I wasn't. ... I think when I was younger, I could get away with pushing it a little bit harder, so I just learned to do that. And when I got older, it didn't work. So some of it was unlearning that. In fact, I just had a breakthrough recently where I attached my warm-ups to my meditation practice. ... It was the permission to stop trying and to allow it to come through. And it's just hard to trust that when you've gotten into a habit of trying for so long — trusting that the easy voice is doing the work on its own. It's good enough. Not only is it good enough, it will move people more. What is it like to have doubts about something that's not only central to your livelihood, but central to your identity? AQB: Is it gonna come back? And if it doesn't, what am I? Who am I? Oh, I've been there. ... It's in your body; you can't even f****** escape it. If you want to put down your guitar or your trumpet and do something else, you can do that. But I couldn't go through my day without talking to someone and hearing [what was wrong with her voice.] There was one point where my vocal chords didn't close, so when air passed through to create the vibration, one would stay still and the other would vibrate. You could hear air coming through while I was talking. So I couldn't go order a cup of coffee without hearing it. ... There's this [feeling of], "I just want to get out of my body. Can I just trade it in and start over?" I didn't think it was gonna go back. Sophie not only brought me back but now, I'm farther ahead than I've ever been. I'm a better singer than I've ever been. ... At this point, I'm looking at five years since my severe vocal issues, and now I'm so far beyond. KM: Can I tell you, as a fellow singer, I just love that. I love that for you. That feeling of, "Wait"ll ya hear this," that's the best. I took six months off the road and I started working with Bill, and [eventually] I was like, "I think we're making some progress, but I don't feel like I'm anywhere near where I need to be. But if I don't go back out there on stage, I'm going to be so scared and it'll be about perfection." And it never was about perfection. So I called my manager and I was like, "I need gigs. I don't even care where they are. I have got to sing in front of people." It was just me and Bill, so I'm vulnerable and exposed. There's no band. So, I would just walk out on stage and say, "I'm struggling with my voice and sometimes it's a thing of wonder and sometimes I hit kryptonite. If I do, I'll just start all over, and we'll find out together what my voice will do tonight." What I found was that my audience appreciated so much being let into the story. They were on my side and it wasn't about perfection—it was about being real. The realer I got, the deeper the connection was, and they got to take the journey with me. It seems like singers don't want to talk about this stuff. Why are you both so open about it? AQB: I don't know how it is for you, [Kathy], because you already had an established career when you were going through this, but I think it just speaks to the fact that I felt like I couldn't say no to any opportunity because we were trying to grow. It's also a woman thing. It's like, "I can get through this." AQB: A hundred percent. If I don't do this, if I can't get it together, then everyone else misses out on these opportunities. KM: They're gonna think that I can't hang, that I'm too sensitive, too delicate, too fragile. AQB: That couldn't be further from the truth for the guys that I play with. But there is that feeling of, "You just have to do [it]," that feeling of, "There's not enough opportunities for everybody to go around, so if I get one, then I've gotta take it." Performing is a physical thing, and even more so when you're the vocalist. How has going through all this changed your relationships to your own bodies? I started doing yoga — I'm halfway through my 200-hour yoga teacher training --- and meditating. Giving my brain and my body time to be for me and not taking this physical expenditure and putting it out for other people. KM: One of the things that Judi kept saying to me, she's like, "You have to learn to play. After you do this for a while, everything becomes about it serving your work. You have to get to know how to play with your voice again." I had this big breakthrough lately where I would get up and stretch out and I would read and meditate, and then I would warm up. And I would be easy about the warm-up. ... It has some technical stuff to it, but it's like playing with placement and playing with sound and stuff. But it doesn't have an agenda attached to it, except just me and my voice dancing around. It's so fun! AQB: That's the same approach [I take] in a yoga class too. It doesn't have to look like Instagram. It doesn't have to look perfect. It just has to be you connecting with the very base of what you do. KM: I have to do enough physical training to give myself enough strength and endurance to be able to get through a show. I used to run and I did a lot of yoga when I was young, and now I have a set of yoga stretches and a workout routine. It's different in your 50s, and I need the strength training, because otherwise I'll run out of gas two-thirds of the way through the show. It's like training for an athletic performance. AQB: It is, yeah. The other thing people don't talk about is when you're on the road ... and maybe there was really bad traffic, so you got to the venue an hour late and now everything's an hour behind and you're rushing. So I'm starving and I'm going to eat something, but I'm going on stage in an hour. ... One time, I puked in my mouth while I was on stage, because I ate a salad with raspberry vinaigrette and took a sip of Red Bull before I got on stage, and it literally all just came back up while I was on stage. AQB: And your stomach is full of acid and sugar, and that was live on [the radio]. ... If you want to hear any more embarrassing stories, I can just keep going. Speaking of possibly embarrassing things, Alanna, I came across videos of the pop-punk band you had in Boston before moving down here. In that band, you had a very demanding role as a vocalist. You had to sing hard, occasionally yell. Now that you're in a soul band with horns, you still attack it hard. Kathy, you've had different modes of singing too, from folk clubs to country arena shows. What are each of your understandings of what a good, satisfying, crowd-pleasing vocal performance looks like? KM: Part of my learning is that you have to sort of negotiate with your adrenaline inside of yourself, because your adrenaline will take over and make you do things that you will love in the moment, and then you'll hate yourself when your voice is tired or swollen or whatever. In my last voice lesson, I was singing a song ... and [my teacher] was like, "You know that second time you did the chorus? You went into your head voice on the high note and it was really beautiful." I said, "Really? I didn't know." And she was like, "Yeah, if you place it right it sounds the same, but your body isn't pushing as hard." Your body's gonna tell you you're not working hard enough, so part of it is trusting the resonance as opposed to the effort. AQB: I'm the total opposite, and that's how I ended up the way that I was, because if there were more people or a tougher audience to win over, I would be like, "I need to kick it up a notch." So I would push on stage, and that didn't help anything. It doesn't make you a stronger singer or a better singer. KM: And even if you win the audience over, there's a price to pay. On your new album, Kathy, it sounds like you really luxuriate in the low notes. And on you band's new album, Alanna, you do a lot with dynamics, but it doesn't sound like you're doing any full force belting. When you listen to the new stuff, what do you hear in your voices? AQB: This s***, I recorded it two years ago, but it was the first thing I had recorded feeling better and stronger, and I was super proud of myself. I am so insecure about my voice. I never am secure about my sound. I never am truly happy with anything. Making this record in front of [producer Kelly Finnigan, frontman of Monophonics] was really nerve-wracking. I just wanted him to think I was good and talented. When you listen to it, do you hear all of that? AQB: I don't hear any insecurity on that record. I hear something really stable. It also had to do with my songwriting too. My songwriting was so much better on this record. So those two things together felt super triumphant. KM: So, what I'm hearing is you put yourself in that situation with this producer, you were nervous but you felt like you came through for yourself. AQB: Totally. I didn't wince when I heard myself back. I didn't wish I had redone anything. I didn't pick it apart. KM: For me, what happened was these were the songs in the living room that I was just throwing out there, so I never thought of it as a record. This was the breadcrumb trail back to singing. So when it came time to make the record, it was like, "Oh s***. These are the songs I've been living with, but this isn't a record—it's all over the place! There's Appalachian stuff and jazz stuff and folk stuff. ... But I think this is what I have to do, because anything else is just gonna be arbitrary at this point. What am I gonna do, go up in my head and find ten songs to do and leave all this stuff that's been the soul of my singing life?" I woke up at 3 a.m. and thought, "Tim O'Brien has to produce this record." He's the safest person I know. He works in all these roots music styles, and in a very authentic way. And we know each other really well, for 25, 30 years. So I called him up, and he said yes. It was great because he has a way of telling you that you need to try something again, and it never feels like he's wavering in his support. ... I thought, "I need home. He's like family to me." It's interesting that you opted for a comfortable dynamic and Alanna went for a nerve-wracking collaboration. KM: You're at a different place in your career. I know my own version of being in that moment [that you were in] where it's like, "I have a shot at doing something that's a leap from the last time I made a record." The fire in the belly kicks in and you're like, "I want to show the world." ... I don't have anything to prove [now], you know? AQB: I think that's the difference — you already had a firm idea of who you were as an artist when you went through this vocal thing. We had this revelation where we would read about ourselves or hear people introduce us, and hear how other people described what we do. One person said I was in a ska band. ... Then a bunch of people said we were in a rock band. Where's the disconnect here? ... I see old cell phone videos of us and I'm like, "Why am I dressed like that? Why are we playing this song?" KM: You have to know who you are, but you also have to listen to the feedback to make sure your intention is coming across, and that's a creative conversation. You've gotta be grounded enough in yourself to know what your intention is and what your strengths are, and have the confidence to go take [voice] lessons, in order to bring yourself forward in the way that you intend. That is a learning process, and the only way you can learn it is by doing.